DuterteNomics blueprint unveiled the build, build, and build for the “golden age of infrastructure,” in the Philippines. ₱23.3 billion North Luzon Expressway-South Luzon Expressway connector road, which starts from C3 Road in Caloocan through Manila, crossing Espana towards PUP, Sta. Mesa connecting Metro Manila Skyway Stage 3. The completion of the SLEX-NLEX connector road, projected to take place in 2020, is expected to reduce vehicle congestion along EDSA, C5 Road and other major thoroughfares, and cut the travel time between NLEX and SLEX to 15-20 minutes from more than an hour. Transportation Secretary Arthur Tugade said at a forum on Tuesday that the subway system, pegged at an initial ₱227 million for the central section, will pass Mandaluyong City and Pasig City. 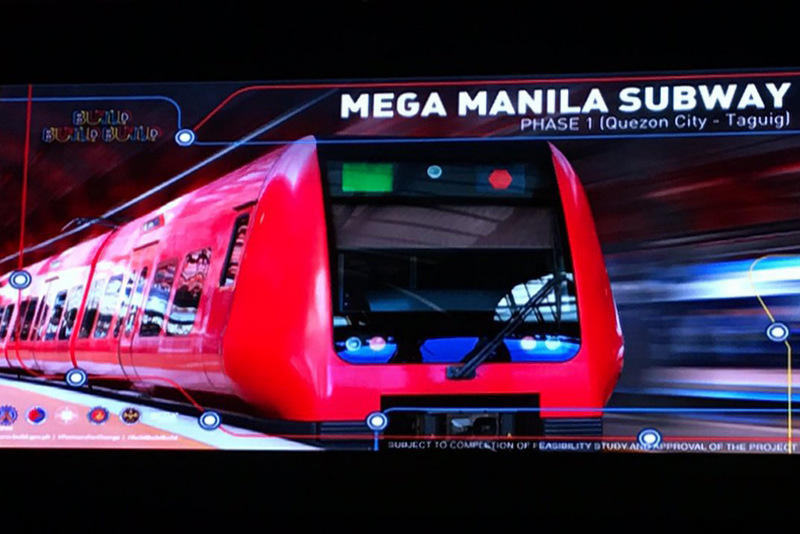 The transport system, the first subway project the country will undertake, is foreseen to accommodate around 300,000 commuters daily, Tugade said. The proposed subway stems from an ongoing Japan International Cooperation Agency's feasibility study, which will be subject to the approval of President Rodrigo Duterte and his officials. The study is expected to be completed in July this year. The Japanese agency's proposal aiming to ease road congestion includes an expansion of the subway to start from San Jose del Monte in Bulacan to Dasmariñas City in Cavite to be completed by 2024. President Rodrigo Duterte's economic managers made the announcements at an event hosted by the Department of Finance and the Presidential Communications Operations Office (PCOO) at the Conrad Hotel, Pasay City. According to the PCOO, DuterteNomics includes the current administration's main governance and fiscal policies, comprehensive big-ticket infrastructure programs and upgraded social services targeted to accelerate growth. The economic and development blueprint also aims to transform the Philippines into a "high middle-income economy" by 2022. Executive Secretary Salvador Medialdea said the economic and development plan is anchored on the 10-point socioeconomic agenda of the Duterte administration that focuses on "the production of a progressive tax reform package and measures designed to bring about increased competitiveness, accelerated infrastructure spending, and improved social amelioration and development programs." Finance Secretary Carlos Dominguez, in a keynote speech, said the Philippines had trailed behind other countries with good economy, but stressed that it is about time to rebuild the country’s competitiveness by pushing for programs such as tax reform package and infrastructure projects. "An investment-led growth pattern creates job and opens more economic opportunities for our people," he said. "We must build a truly inclusive economy. To do so, our economy should be investment-led, creating new jobs and opening opportunities for all." Dominguez said the government is also looking forward to what has been called a "demographic sweet spot," as the populations of some of the more mature economies in Asia begin to age. He said that the administration has to invest in the Filipino youth. Line 7 PPP Project (San Jose Del Monte-North EDSA). The Central Corridor (EDSA) Bus Rapid Transit (BRT). The government is spending 5.3 percent of the country’s gross domestic product in 2017 to finance the building, Finance Secretary Carlos Dominguez said. This will be raised to 7.1 percent by 2022. This is higher than the 2.6 percent annual average of the past six administrations in the last 50 years, he said. “In the decades when we neglected our infrastructure, we lost out on competitiveness,” Dominguez said. Budget Secretary Benjamin Diokno said the government under Duterte would spend P8.4 trillion for infrastructure. A government portal (www.build.gov.ph) was also launched to help the public guard the infrastructure projects against corruption. Presidential spokesperson Ernesto Abella said the website would be regularly updated to reflect the progress of every project.